Tired, poor, huddled masses yearning to breathe free need not apply. The United States Citizenship and Immigration Services no longer uses language that describes the country as “a nation of immigrants" in its official mission statement, an agency official said Thursday. The USCIS, the federal agency tasked with granting visas and citizenship, has changed to a new statement that “clearly defines the agency’s role in our country’s lawful immigration system and the commitment we have to the American people,” according to a letter sent to employees by agency director L. Francis Cissna that was obtained by NBC News. 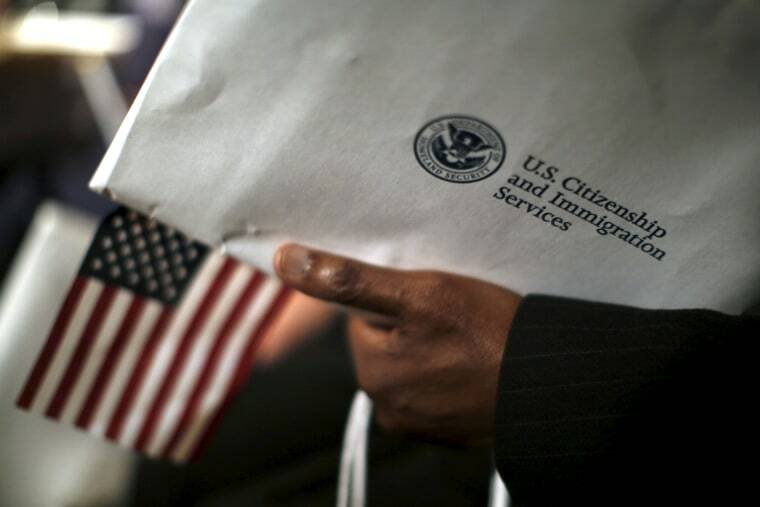 “The agency’s new mission statement was developed and debuted within the agency by USCIS Director Cissna during his first conference with USCIS senior leadership from around the world," a USCIS public affairs officer said in a statement to NBC News. "It reflects the director’s guiding principles for the agency. This includes a focus on fairness, lawfulness and efficiency, protecting American workers, and safeguarding the homeland." "U.S. Citizenship and Immigration Services administers the nation’s lawful immigration system, safeguarding its integrity and promise by efficiently and fairly adjudicating requests for immigration benefits while protecting Americans, securing the homeland, and honoring our values." President Donald Trump’s pick, Cissna was sworn in as director of USCIS in October. The wording change was not welcomed by some pro-immigration groups. "Our nation is one built by immigrants — removing this language does nothing to change that fact, it only reveals the insidious racism harbored by those in this administration," said Eleanor Acer, senior director for refugee protection at the Human Rights First, in a statement. "We cannot separate 'immigrants' from 'Americans' — we are intrinsically linked as children, parents, neighbors, and loved ones. By seeking to distinguish between the two, the administration is turning its back on our nation’s proud history and engaging in dangerous revisionism."